This versatile fondue pot is equipped with a stovetop-safe cast-aluminum insert that offers the convenience of cooking and serving fondue all in the same pot. Leave the insert in for delicate cheese and dessert fondues (the insert lets you heat cheese and chocolate without scorching), or remove the insert to prepare meats in oil. The stainless steel fondue pot features a sturdy aluminum base for maximum stability and a lid with evenly spaced slots that not only ensure even cooking, but also provide a spot for holding eight forks in an upright position. 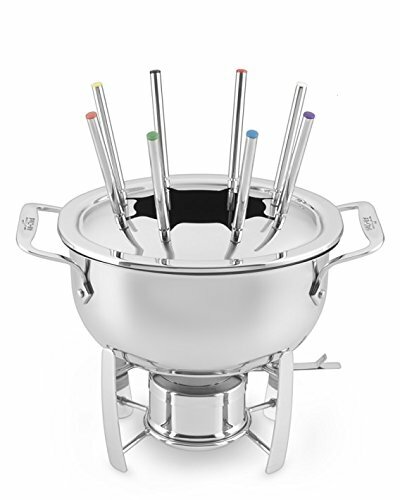 The fondue pot also comes with eight, color-coded fondue forks, a stand and a Sterno burner (fuel not included).